Figure 12-6. Sake flow chart. Adapted from Yoshiwawa and Ishikawa, 2004.
for forty to forty-eight hours at 30°C to 35°C under high humidity.The koji is mixed at intervals to re-distribute the growing fungi, maintain aerobiosis, and prevent excessive heat build-up. When finished, the rice should be covered with fungal mycelia and should contain high amylolytic and proteolytic activities. Next, the koji is moved to a tank, and the steamed rice (from above) and water are added.This material, called moto, is essentially a pre-culture whose purpose is to increase the population of endogenous yeast and lactic acid bacteria (see below) and to initiate a fermentation. According to traditional sake brewing practices, this moto seed culture incubates for about two weeks at 15°C, and then defined sake yeast strains are added. It is now more common, however, to add sake yeast at the outset, rather than rely on wild yeast for the initial fermentation. As the moto incubates, enzymatic hydrolysis of rice starch and proteins occur, releasing sugars and nutrients that support growth of the yeast. The moto is eventually transferred to large tanks (capable of accommodating more than 10,000 kg of rice) containing more koji, steamed rice, and water for combined mashing and fermentation. The fermenting mixture, now called mo-romi, is then diluted several times with an equal amount of koji-rice-water, at two-to-three day intervals, such that the now thick , moromi mash increases in volume three- to four-fold. 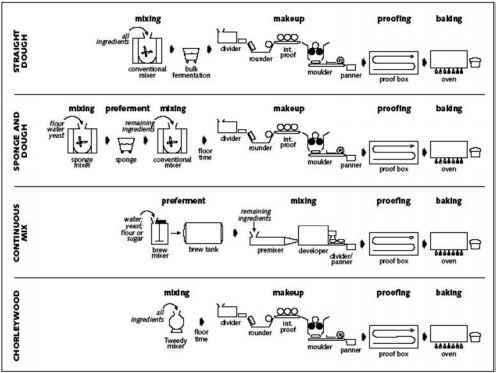 This process ensures that the yeast population remains high throughout the fermentation and provides, on a step-wise basis, adequate amounts of substrates to support an extended, semi-continuous fermentation.This unique fermentation process also serves to maintain lactic acid levels and a moderately high solids content, such that contaminating organisms are inhibited.Thus, even though the sugar concentration never reaches much more than 6% to 8%, the ethanol concentration in the finished product may be 18% or higher. To achieve such a high yield of ethanol by a simple batch fermentation (i.e., where all of the fermentable sugar was initially present) would require a mash containing as much as 30% glu-cose.This is far more than could be osmotically tolerated by the yeast and would result in a stuck fermentation. Although the origin of sake manufacture, like most other fermentations, dates back thousands of years, ways to improve the fermentation are now actively being explored. In particular, there has been interest in modifying sake yeasts to enhance fermentation efficiency, flavor, and the overall quality of the finished product. One specific approach, described below, involves isolating a particular class of foam-defective mutants that have been used successfully for more than thirty years in the Japanese sake industry. The molecular basis for this phenotype of these strains, however, has only recently been studied. Growth of sake strains of Saccharomyces cerevisiae results in formation of a thick froth or foam layer.The foam occupies so much volume in the fermentation tank (as much 50%) that less space is available for the moromi. High throughput processes are required in modern, large scale sake manufacturing facilities. High-foaming fermentations decrease production capacity. Fermentation efficiency could be improved if foam formation could be reduced using non-foaming yeast strains. This rationale led researchers in Japan to establish screening protocols so that non-foaming mutants could be isolated (Ouchi and Akiyama, 1971). The screening strategies were based on the observation that froth or foam is formed either by strains that agglutinate to one another via a capsular material or by strains that have affinity to the surface of gas bubbles. One method involved separating agglutinating wild-type cells from spontaneous non-agglutinating mutants during a series of successive fermentations, thereby concentrating the non-agglutinating, non-foaming cells.Alternatively, a similar approach was used to isolate S. cerevisiae cells that did not have bubble affinity. In this case, cells were grown in broth in the presence of sparged air (to form bubbles).Wild-type cells, having affinity for bubbles, stuck to the bubbles and accumulated in the froth layer.The non-foaming mutants could then be retrieved from beneath the froth layer and re-inoculated into fresh broth, with the entire cycle repeated several times.The mutants were then isolated by plating, characterized to ensure other desirable properties had not been lost, and then used successfully in commercial production (and are still in use). A more recent investigation on the molecular differences between foaming and non-foaming sake strains has led to the identification of a gene that confers the foaming phenotype (Shimoi et al., 2002).The AWA1 gene ("awa" is Japanese for foam) encodes for a cell wall protein that is covalently attached to glucans located within the cell wall. Insertion mutants that did not express Awa1 did not form foam in a sake mash. Interestingly, this gene is not present in the S. cere-visiae genome database (built from laboratory strains), indicating it is likely specific to sake strains.Using a method that measures cell surface hydrophobicity (i.e.,adherence ability),it was also shown that wild-type cells were significantly more "hydrophobic" than non-foaming cells. Thus, the latter cells are less likely to attach to other cells or to the surface of gas bubbles that form during the sake fermentation. A second protein involved in the foaming phenotype was also recently identified by proteome analysis using two-dimensional electrophoresis.The protein,YIL169c, was qualitatively and quantitatively different between the foaming parental strain and a non-foaming mutant. Protein sequence comparison of YIL169c with the S. cerevisiae genome data base revealed that this protein was similar (71.5% identity) to YOL155c, a cell wall protein with glucosidase activity.Thus, although the function ofYIL169c has not been determined, it appears that this protein likely protrudes from the cell wall, where it can interact with bubbles or other hydrophobic surfaces. Ouchi, K., and H. Akiyama. 1971. Non-foaming mutants of sake yeasts: selection by cell agglutination method and by froth flotation method.Agri. Biol. Chem. 35:1024-1032. Ouchi, K., and Y. Nunokawa. 1973. Non-foaming mutants of sake yeasts: their physio-chemical characteristics. J. Ferment.Technol. 51:85-95. Shimoi, H., K. Sakamoto, M. Okuda, R.Atthi, K. Iwashita, and K. Ito. 2002.The AWA1 gene is required for the foam-forming phenotype and cell surface hydrophobicity of sake yeast. Appl. Environ. Microbiol. 68:2018-2025. Yamamoto,Y., K. Hirooka,Y. Nishiya, and N.Tsutsui. 2003 The protein which brings about foam-forming by the sake yeast. Seibutsu-Kogaku Kaishi 81:461-467 (Abstract only). sake fermentation. In particular, endogenous lactic acid bacteria, including Lactobacillus sake and other Lactobacillus and Leuconostoc sp., grow and produce acid early in the fermentation. This early acidification evidently helps to control other adventitious organisms, although the lactics are eventually inhibited by the high ethanol, high acid, and high osmotic pressure that accumulates in the moromi. Lactic acid can be added directly to promote acidification, a now-common practice in modern sake facilities. After about three weeks, the fermentation is ended, and the moromi is separated by settling and filtration, yielding a sake cake and a very clear, light yellow liquid, which is then called sake. The sake can be aged (usually only a few months), adjusted to a desirable ethanol content, pasteurized by heat (65°C) or ultrafiltration, and bottled. Like grape-derived wine, the finished sake can be sweet or dry. However, this classification is not entirely based on the amount of residual sugar that is present, but rather on a combination of the sugar, acid, and alcohol content. Depending on the type of sake and consumer preference, sake can be served warmed (35 °C to 40°C) or slightly chilled. In general, higher quality sake is usually served at the lower temperature to retain more of the aroma and flavor volatiles.